The paintings of Northwest artist, Sherrie Wolf are influenced by the artist’s joy of still life and a strong interest in European and American art history. 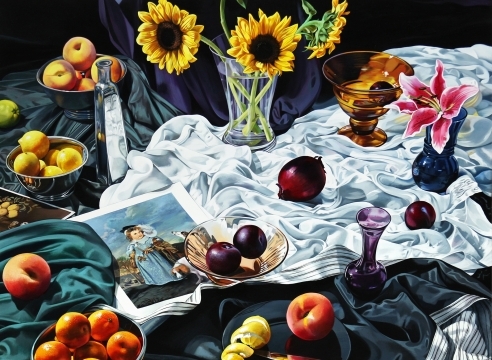 Wolf plays with illusion by combining still lifes with elements of paintings from art history, a technique that connects her work to the traditions of reinterpretation and artistic borrowing. Sherrie explains, “As a still-life painter, I openly play with artifice and historical references. I arrange related objects in front of excerpts from old master paintings, and discover interactions between these two invented worlds.” In this exhibition, Animal Life, the still life plays with the narrative, various animals peek out or co-mingle with the flowers or fruit. Here, the artist experiments with juxtaposition and camouflage to discover the work’s narrative resonance. Sherrie Wolf graduated from the Museum Art School, now the Pacific Northwest College of Art, in 1974 and received an MA from the Chelsea College of Art in London, England in 1975. She began exhibiting her work in the mid 1970s while teaching art at PNCA. Her work is included in such collections as The Vivian and Gordon Gilkey Center for Graphic Arts, Portland Art Museum; Hallie Ford Museum, Salem, OR; City of Seattle; Washington State Art Collection; and Southern Oregon State College, Ashland. Homage, an actual-scale re-creation painted by Sherrie Wolf of Courbet’s The Artist’s Studio: A Real Allegory will be on view at the Art Gym, Marylhurst College, Nov. 2 – Dec. 7th, 2008.